Pound for pound veal contains less calories and ½ the fat of beef; it’s lean, tender and just plain delicious in my opinion. So when Mountain States Rosen contacted me to review some of their veal products of course I said yes. Mountain States Rosen has been producing veal that is free from hormones and artificial tenderizers for over 45 years and prides themselves in having top quality meat. One of the cuts of veal I received was the shank....and what better thing to make than osso buco. osso buco is Italian for "bone with a hole" (osso bone, buco hole), a reference to the marrow hole at the center of the cross-cut veal shank. Often paired with risotto; osso buco makes a nice slow cooked one-dish meal. It also works well with gnocchi as in the recipe below. Preheat oven to 275. Dredge the shanks with flour, shaking off any excess. Choose a large oven safe pot with a lid and set over moderately high heat. When hot add some olive oil to coat the bottom of the pan. Add the shanks and brown on both sides. Remove from the pot and season with salt and pepper. Set aside. Add more olive oil to the pan. Add your celery and onion and cook over medium heat until soft, about 10 minutes. Add the garlic and anchovies and stir 1 minute. Add the red wine and bring to a boil, scraping up any browned bits from the bottom. Finally stir in your stock. Return the veal to the pot and bring to a gentle simmer. Cover with parchment paper then the pot lid. Bake in the over for about 3 hours, or until the meat is fall off the bone tender. Periodically check to make sure the liquid is simmering gently. Chop all of the ingredients and combine in a small bowl. I don't buy veal enough because of the price. But this is one of my favorite meals in the world and your presentation is scrumptious. It seems that everyone in MN makes osso bucco with pork shanks. Sigh. No. Veal - yum! I don't cook with veal very often and I don't know why. This looks fantastic. i thought its a banana o.o seriously hhehe. anyway good work. its so classy added to my list dear .. I haven't had gnocchi in forever. This version sounds so good! I absolutely love osso bucco, and the gremolata is a must. 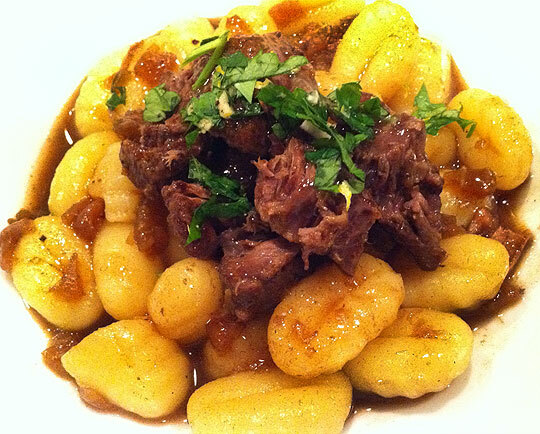 I've never tried it though with gnocci, though it sounds like a great idea as it would soak up some of the lovely sauce. Sounds wonderful! That sounds and looks positively delectable! Drooling. . .